A managed VM (and associated Instance) needs to be unmanaged and returned to Discovered type. Remove Associated Instances Must be checked if the server has an associated Instance, as deleting the VM but not the Instance would result in an abandoned Instance thus not allowed. The “Remove from Infrastructure” flag when deleting a VM or Host in Morpheus determines if the actual VM is deleted from the target Infrastructure. Checking “Remove Infrastructure” means you WANT TO DELETE THE ACTUAL VM. Typing “DELETE” in the confirmation field is required when “Remove From Infrastructure” is enabled. Unchecking “Remove Infrastructure” means you only want to delete the record in Morpheus but leave the actual VM untouched. Deleting an Instance will always remove Infrastructure. REPEAT: Deleting an Instance from the Provisioning section will always remove the VM aka Infrastructure. 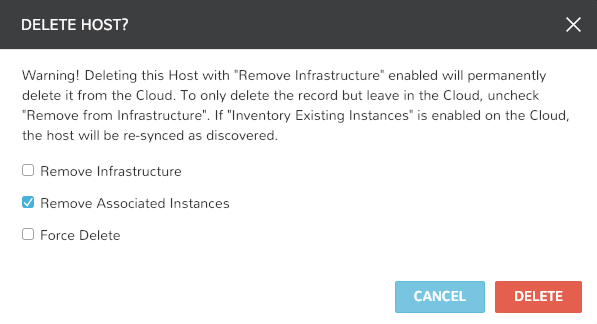 After removing the record from Morpheus, the VM must be in a Cloud with Inventory enabled to automatically be re-discovered. VM’s inside an Instance can be navigated to inside the Instance Details page by selecting the VM in the VM's seciton on the Instance Details page. If you have to type DELETE that means the Remove Infrastructure flag is selected and you are confirming deletion of the actual VM. Ensure Remove Infrastructure is UNCHECKED when you want to leave the VM intact! The VM and associated Insatnce will be removed from Morpheus but the actual VM will remain. Wait up to 5 min or click REFRESH on the associated Clouds details page to force a cloud sync. Inventory must be enabled on the associated cloud for the VM to automatically be re-discovered by Morpheus. The VM is now back in Morpheus as discovered/unmanaged. To managed and create a new Instance from the VM, select ACTIONS : Convert To Managed.